If you purchased your health insurance plan through healthcare.gov or your local state exchange, you have an Affordable Care Act (ACA) compliant plan, which means you have mental health insurance coverage. All ACA-compliant insurance plans must include mental health insurance coverage as one of the 10 essential health benefits. Mental health includes emotional, psychological, and social well-being. A mental health practitioner can help you manage stress and anxiety or more critical illnesses such as depression or substance use disorders. What Does My Specific Plan Cover? Visit the Insurance tab on your Stride dashboard. Scroll down to “Doctors". Click on the link. 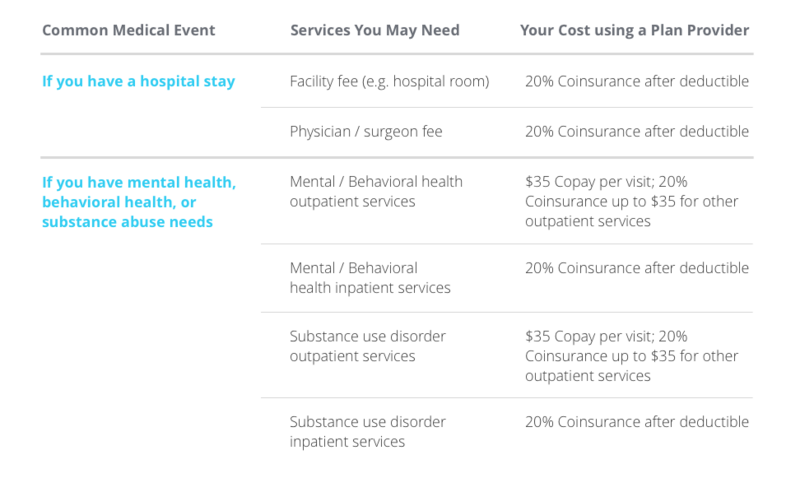 In this mental health insurance coverage example, the member will pay $35 for each outpatient. Your mental health insurance coverage may be different, so follow the steps above to find out the costs for your specific plan. I’m Looking for Extra Support; What Is Out There? Hotlines offer immediate support for people experiencing an emotional crisis or suffering from mental health problems. You can expect emergency support and crisis intervention when you call a hotline. You can find a list of common hotline phone numbers here. Warmlines also offer support for people suffering from mental health problems, but serve to provide assistance, comfort, and referrals. Calling a warmline can be a great way to find out about services in your area and local professionals. To find your local number, try Googling “warmline” and your state. Drop-in centers exist to provide a safe and supportive environment for those suffering from mental health problems. You can expect to find organized activities and services in a friendly environment. Support groups are offered in most communities at churches and schools for a variety of mental health problems including alcoholism, drug abuse, and eating disorders. Most of these groups are anonymous and you can find them by doing a simple Google search of “support group” and your city. Still have questions about your coverage? Feel free to email support@stridehealth.com. We can help you find your plan’s mental health insurance coverage and help you find the right mental health practitioner for you!